The Florida Department of Citrus (FDOC) needed a hero. With a rampant disease called greening hurting the production of oranges, declining sales and rising prices, times haven't been easy. 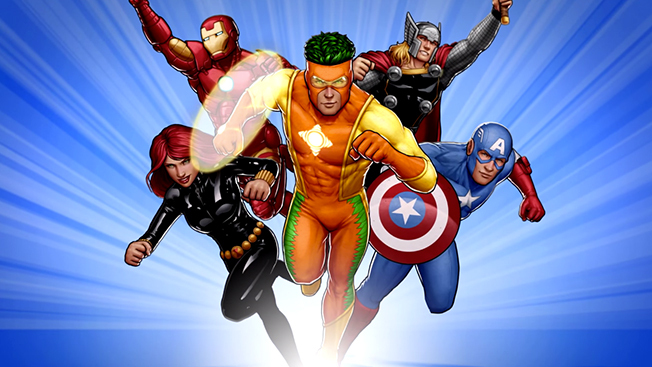 Enter Marvel; the comic giant has given the FDOC's hokey mascot, Captain Citrus, a head-to-toe makeover. Will it be enough to make a difference? Adweek spoke with FDOC spokesman David Steele to find out more. How did the collaboration with Marvel come about? The idea to redesign our existing Captain Citrus program came up during a conversation our team had with Marvel earlier this year, out in [Los Angeles]. We there to explore product placement opportunities in Marvel's feature film properties, but the conversation expanded to include the work that their Custom Solutions unit does. We had already decided to terminate or dramatically redesign our Captain Citrus character. He had been a rotund, jovial character from outer space, and we knew that we wanted to reach kids and families with a character that was more fitness-focused and also more grounded in our state's identity—and we also wanted to develop something that would capture imaginations across the country and around the world. As we talked, it became obvious that a partnership between our organization and Marvel was a classic no-brainer. The collaboration was a case of spectacular serendipity. I wish we could say we went out to L.A. with a well-conceived plan, but we were really there to explore something as simple as product placement. The dialogue we enjoyed is what ultimately produced "The Big Idea." Did you work with an advertising agency? If so, which one? The relationship was the result of direct engagement with the Marvel team. However, as the program has evolved, we have also worked closely with The Food Group, one of our long-time agency partners. We considered this partnership a long-term investment. We own the Captain Citrus character outright and plan to use him in a variety of ways for many years to come. Our formal contract with Marvel expires at the end of this fiscal year, following the distribution of what will be his third custom comic, featuring the Avengers. However, we are already exploring future partnership opportunities with Marvel. The goal of Captain Citrus has always been to connect with children and their families while sharing the message of the nutritional benefits of Florida Citrus. Marvel allows us to do that on a global level and reach audiences in a new way. Superheroes are fun and so is Florida Orange Juice. Marvel's ability to inspire and captivate audiences through compelling characters, innovative storytelling and game-changing licensing strategies represent a dynamic model we wanted to emulate. On top of all of that, it's also hard to ignore the fact that our launch of this program generated well over 600 media stories in its first week. That's a buzz most of us only dream about, but our own Marvel-designed hero made it happen. We feel lucky to be along for the ride! Was Marvel behind the character redesign? Marvel led the redesign, but we were actively involved throughout that process. It was very collaborative, but we were, of course, very eager to get the full "Marvel treatment." They do this better than anyone in the world, and we wanted the full benefit of that Marvel magic. The comic was produced by Marvel's creative team. As with the character design, we had creative input throughout the process—but the intent was to deliver an authentic, custom Marvel piece. I think anyone who reviews the first comic (which is available digitally now at CaptainCitrus.com) will agree we hit the mark. The total cost of the program this year was $1 million. That includes the character design and ownership, full-color teaser inserts in about 2.5 million "Captain America: Winter Soldier" DVDs, an animated teaser video with the Avengers, 1 million printed comic books, with accompanying teacher's guides, two digital sequels, a Comic Con NYC activation, and a contest activation for Captain Citrus fans, plus distribution of the comic books and teachers' guides to schools across the country.